In one of the pages on Cockney rhyming slang there is mention of various pre-decimal coins e.g. "thrupney bit" and "two bob bit". Anyone born after 1970 is unlikely to know anything about this type of currency so this, together with an email from Diana Tranter (a site visitor) meant "I felt a new page coming on!". "A 'thrupney bit' was a threepenny 'bit' (pronounced ‘thra’pny’) which was worth 3 (old) pennies when there was 12 pennies in one shilling (1/-d). The 3d bit was a coin shaped like a 20p piece but the 3d bit was a yellow bronze colour and much thicker in diameter and heavier than the 20p of today. Before the yellow bronze 3d bit, there was a silver 3d bit which was much smaller than our 1p of today and also much lighter in weight. A 'tupney' bit....there never was a two penny coin in £.s.d.. There was a copper Farthing (1/4d) about the size of our 1p of today. The Farthing was worth a quarter of one (old) penny - 1d), there was a copper half penny coin (commonly called ha'pny - 1/2d) about the size of our 5p coin of today - and there was a one penny coin which was a large copper coin about the size of our £2 coin of today, but the 1d copper coin was not as thick in diameter. There was no two penny coin…." Please note these images are larger than the actual coins - see note below. 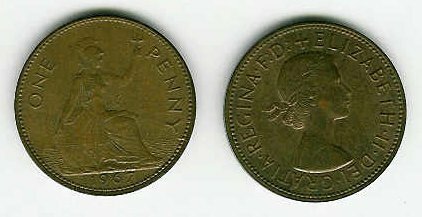 Reading about pre-decimalisation UK coinage, and looking at the scanned photos which appears slightly larger than life on my screen, I was reminded that the ha'penny was exactly 1 inch in diameter. Also just like today's 5 and 10 p pieces, or the 1 and 2 pence pieces, the weights of the farthing, ha'penny and penny were in proportion to their value, as were the sixpence, shilling and florin (and just possibly the half-crown, too). i.e. 2 halfpennies weighed the same as 1 penny: 4 farthings weighed the same as 1 penny: 2 farthings weighed the same as 1 halfpenny: 2 sixpenses weighed the same as 1 shilling; 2 shilling pieces weighed the same as a florin and a florin and 1 sixpence weighed the same as a half-crown etc. £5 note…in 1963 we used to apologise to the shop assistant if we were to hand over a £5 note as it was equivalent of half a week’s wages for a secretarial school leaver in 1960 era……and a nice 3 bed semi detached house would have been worth less than £3,000!!! £100 was known as a “pony” but there were no notes after the £10 note which was brown in colour. The £5 was blue colour. Anyone with their own bike would get a 6d per day allowance which amounted to 3/6d. this was a real bonus as it boosted a week’s wages up to 12/- a week! !